by Florence Kate Upton in the late 19th century. 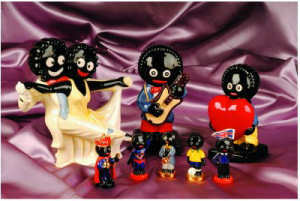 The Golliwogg was inspired by a blackface minstrel doll Upton had as a child in America. The child of English parents, Upton and her family moved to England when she was fourteen. There she spent several years drawing and developing her artistic skills. 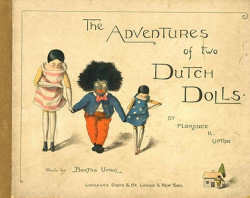 In order to afford tuition to art school, she illustrated a children’s book entitled The Adventures of Two Dutch Dolls and a Golliwogg. The 1895 book included a character named the “Golliwogg”, who was first described as “a horrid sight, the blackest gnome”, but who quickly turned out to be a friendly character, and is later attributed with a “kind face”. He sported red trousers, a shirt with a stiff collar, red bow-tie, and a blue jacket with tails — all traditional formal minstrel attire. Upton’s book and its many sequels were extremely successful in England, largely because of the popularity of the Golliwogg, which became the generic name for dolls and images of a similar type, spelt “golliwog”. The golliwog doll became a popular children’s toy throughout most of the 20th century, and was incorporated into many aspects of British commerce and culture; for instance, some of Enid Blyton’s books feature them, once as a villain and at other times as heroes. Upton’s Golliwogg was jovial and friendly, but some later golliwogs would be sinister or menacing characters. However, small boys in the 1950s, who would never dream of playing with sissy dolls, had no qualms about a big rag golly and as many golly badges as possible. 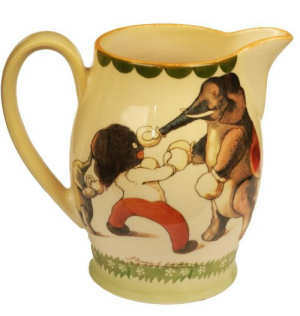 The golliwog made its way back across the Atlantic in the form of children’s literature, dolls, children’s china and other toys, ladies’ perfume, and jewellery. British jam manufacturer James Robertson & Sons used a golliwog called Golly as its mascot from 1910, after John Robertson apparently saw children playing with golliwog dolls in America. Robertson’s started producing promotional Golliwog badges in the 1920s, which could be obtained in exchange for tokens gained from their products. In 1983, the company’s products were boycotted by the Greater London Counci l as offensive, and in 1988 the character ceased to be used in television advertising. 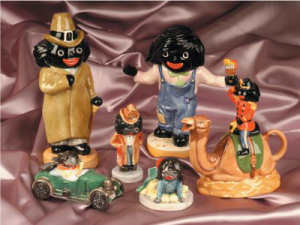 The company used to give away golliwog badges making up different sets, such as playing jazz instruments, or with sports equipment, or other such the mes. After many generations of children, the promotion was dropped in 2001, and replaced with Roald Dahl characters. 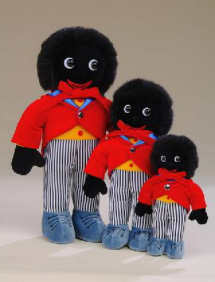 Robertson’s claimed the decision to retire the Golliwog was simply a commercial decision and had nothing to do with accusations of racism. Today, Robertson’s Golliwog badges remain highly collectable, with the very rarest sometimes selling for more than £1,000, and even comparatively common and recent badges being worth £2.00–£3.00.